Bonobos are the world's least-recognized great ape, and humanity's closest living relative. This endangered species lives exclusively in Africa's Congo Basin, in the Democratic Republic of the Congo (DRC). Only an estimated 15,000 bonobos remain in the wild – poaching and habitat loss are pushing them to the brink of extinction. I fell in love with these amazing animals a few years ago when I narrated "The Bonobo Connection." I learned that bonobo societies are matriarchal, and unlike our other closest relatives, chimpanzees, are incredibly peaceful. Female-led groups of bonobos are highly empathic, and use affection rather than aggression to resolve conflict and to strengthen social bonds. It is a tragic irony that this peaceful species is only found in one of the most war-ravaged countries on Earth. Now that the Congo is rebuilding after years of conflict, groundbreaking efforts are underway to protect and study bonobos. The DRC is currently considering how to manage the habitat of bonobos – some of the most biodiverse rainforest in Africa. The world must encourage the DRC to protect the only home of bonobos by maintaining its current logging moratorium, rejecting oil drilling, expanding their protected habitat and supporting community-led conservation efforts. I truly believe that through greater understanding and a heightened awareness of bonobos, humanity will benefit. I will be visiting the DRC soon, to view bonobos in the wild and meet with conservation leaders and government representatives. I would be honored to deliver your petition signature and add your voice to the global call to protect our sister species. Please join me. 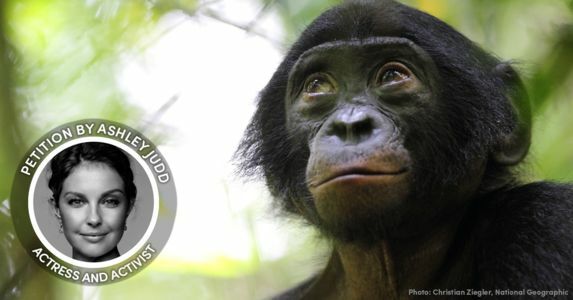 Please help protect our closest living relatives and their Congo rainforest home with a tax-deductible donation to the Bonobo Conservation Initiative.